When the sky is all one color (grey) and you crave a bowl of something at once new and familiar, comforting and stirring to curl up with, look no further than this simple cream of celery soup. You can be down to fairly little in the icebox and still have the necessities to pull this together: cream or half & half (or even whole milk), a head of celery, some sort of allium, stock or broth, butter, a potato or two, and some herbs and spices. This soup is nothing more or less than it claims to be: it is thinly luscious while boldly bearing the essence of celery. Adorned with a sprinkle of coarse sea salt, a drizzle of olive oil and some thick cut whole grain toast, this is a peasant's lunch fit for a midwinter queen. Melt butter completely in a large pot or Dutch oven over medium heat. To the pot, add celery, potato, leek (or onion, etc.) and garlic. Season with a bit of salt to start, (don't add much until you taste the soup). Cook the vegetables, stirring occasionally, until your allium is tender, about 8–10 minutes. Add broth to the pot and simmer until the potatoes and celery are tender, 8–10 more minutes. Stir in the dill. Purée using an immersion or standard blender. Wistfully stir in cream until combined. Taste and season accordingly. Serve soup topped with sea salt, pepper and olive oil, plunked with homemade croutons or accompanied by your favorite rustic bread. In other news, I'm now a snow shoer. I ventured out into the grey mist yesterday with Chetney and listened to the waves crash against icicle-covered peers, rocking giant shards of ice and bobbing gulls in their wake. Tomorrow I'm beginning a 30-day Minimalism Challenge from the blog Into Mind (found by way of Shutterbean's I Love Lists Friday). In 30 days I will complete 30 simple yet poignant tasks to pare down the stuff of life and in turn hopefully find more space in the every day. You can do the tasks in any order, and tomorrow I will begin with challenge number 2: "meditate for fifteen minutes." I plan to share my experiences with the 30 day challenge here regularly, if the "stuff of life" does not place itself too densely in my path. I'll be in touch. Stay warm friends. My house smells of bacon and wood fire. It's Monday and I've just washed the last dish from a family supper we hosted last night that ended with our loved ones sitting fireside enjoying bowls of homemade pistachio ice cream and talking about snow-shoeing. Stack that on top of an epic Packers victory and an amazing first week of dietetic internship and you've got the recipe for a happy Ashleigh sundae. 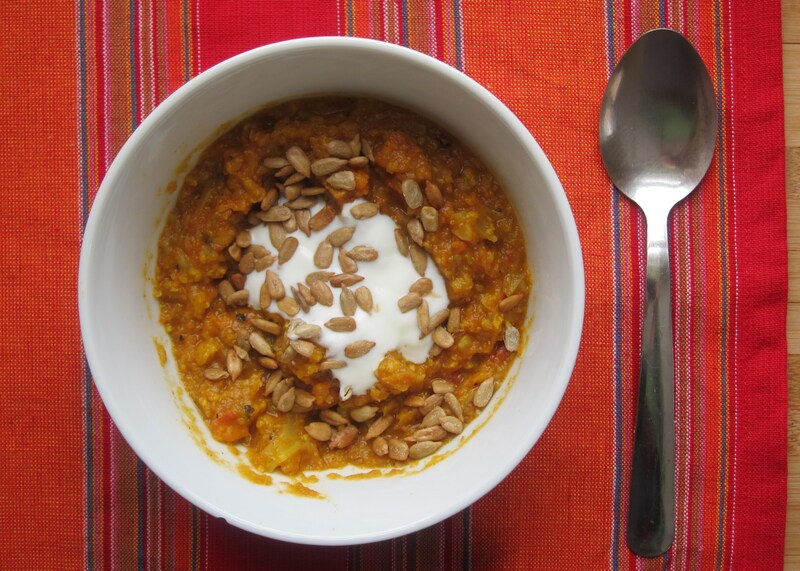 Vegetal, sweet, creamy, and smoky, this soup is a snuggie in a bowl folks. Slow-simmering the vegetables for an hour lends what the French call a certain "I don't know what" to the flavor profile. Well, that and starting by sautéing onions in bacon fat. Allspice and nutmeg warm things up while apple lends brightness and potato helps with rib-stickiness. Enjoy a bowl fireside or whilst standing by the microwave in your work cafeteria. Either way this soup will be a proverbial lumberjack foot massage atop fleece sheets in a sauna for your soul. Melt bacon fat in a large pot (such as a Dutch oven) over medium heat. Add onions and saute until softened and slightly browned, about 10 minutes. Add nutmeg and allspice and sauté a minute more. Add potato, apples and parsnips; stir in vegetable broth and increase the heat to bring soup to a boil, then reduce heat to maintain a slow simmer, keeping the soup covered, until vegetables and apples are very soft, about an hour ( you can get away with 30 minutes if you're in a time crunch). Puree using an immersion blender or in batches using a standard blender. Wistfully stir in the half and half and add salt and pepper, tasting as you go. Top with crumbled bacon and enjoy emphatically. This is the book that kicked off my food loving, healthy eating, conscious cooking, nutrition fascinated journey. 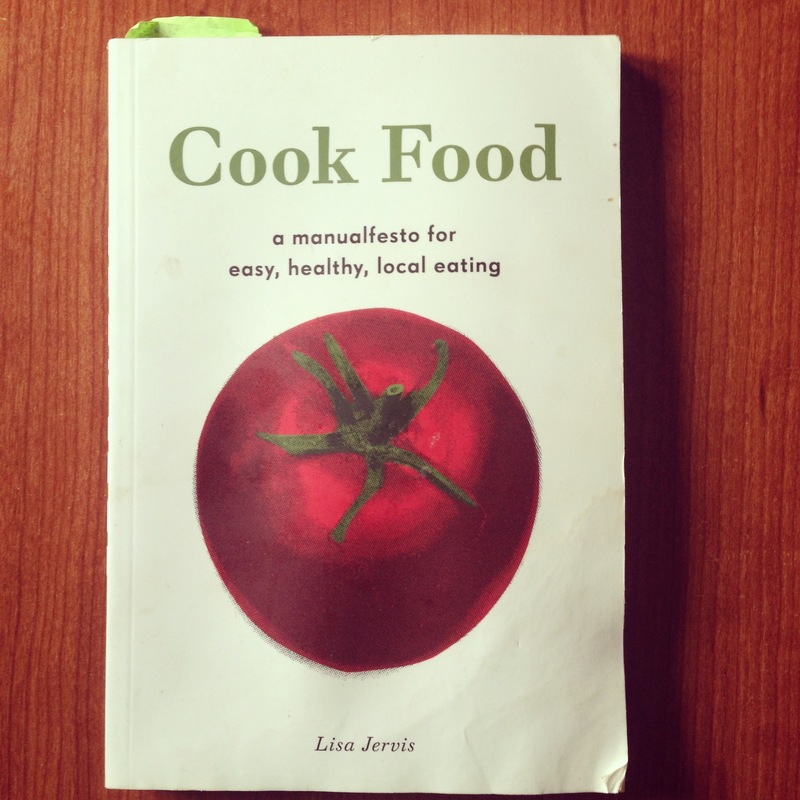 I bought “Cook Food” by Lisa Jervis about five years ago in a small artsy-touristy shop in my hometown of Cedarburg, WI. I still like looking through the stained and crinkled pages of this small paperback book at the sentences and phrases I underlined and highlighted way back when. And although there has been much learning and growing since those days, I stay grounded in many of the methods and sentiments that Jervis offered me in this short, friendly guide to health and planet-conscious cooking and eating. All the recipes in “Cook Food” are approximate and flexible. Jervis encourages readers from the very first pages to “experiment, try new things, make the recipes your own.” Well I certainly took that imperative and ran with it. I barely ever perfectly follow recipes (gasp?!) and only break out the measuring cups and spoons when I’m baking. I tend to use cookbooks as tools of inspiration: I mine them for new flavor combinations or seek advice on how to use an ingredient I’ve never tried. But… I have to say this non-recipe cooking style doesn’t serve me very well when I want to share something I’ve made here on Funky Beets. Case in point: I recently made this epically tasty soup, but hadn’t really measured anything in the process. Well, luckily for me (and you!) I do have a pretty slick memory, so I think this should still work out (fingers crossed). I’m sure Lisa Jervis would agree here, you should take liberties with this soup, add more of the ingredients you like, leave out the ones you don’t. Get a little artsy with it, and TASTE along the way. Tasting your cooking as it unfolds is the best way to ensure non-recipe cooking turns out fabulously; I read somewhere American cooks don’t do enough of it, so let’s prove whoever said that wrong. Let’s dip our spoons liberally in bubbling pots on their way to becoming dinner. Just don’t forget to blow on your spoonfuls before you sample; this soup won’t taste as good with a burnt tongue. 1. In a Dutch oven or other large pot, melt the oil over medium heat. Add the onions and sauté for a few minutes. Add the garlic and spices, stirring until fragrant. 2. Next, add all the cauliflower and sweet potato chunks, stirring around with the alliums and spices until coated. If you have extra time, you can let the vegetables get a little browned (flavor!) before moving on to the next step. 3. To the pot, add the canned tomatoes (with juice), chickpeas and coconut milk. Now add enough water to just barely cover the cauliflower and sweet potatoes. Stir it all together until the broth is mostly uniform in color. 4. Bring the mixture to a boil, then reduce to a simmer and put the lid on your pot. Stir occasionally. 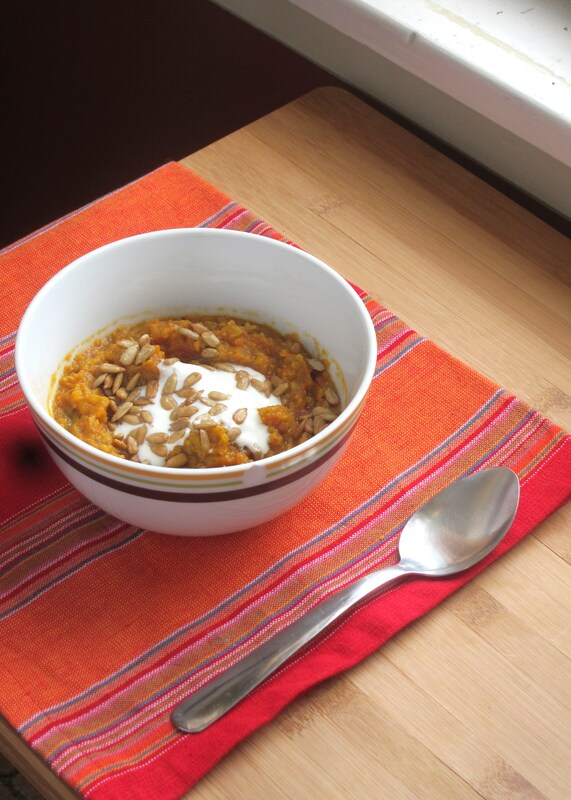 When the sweet potatoes are soft, the soup could be finished. 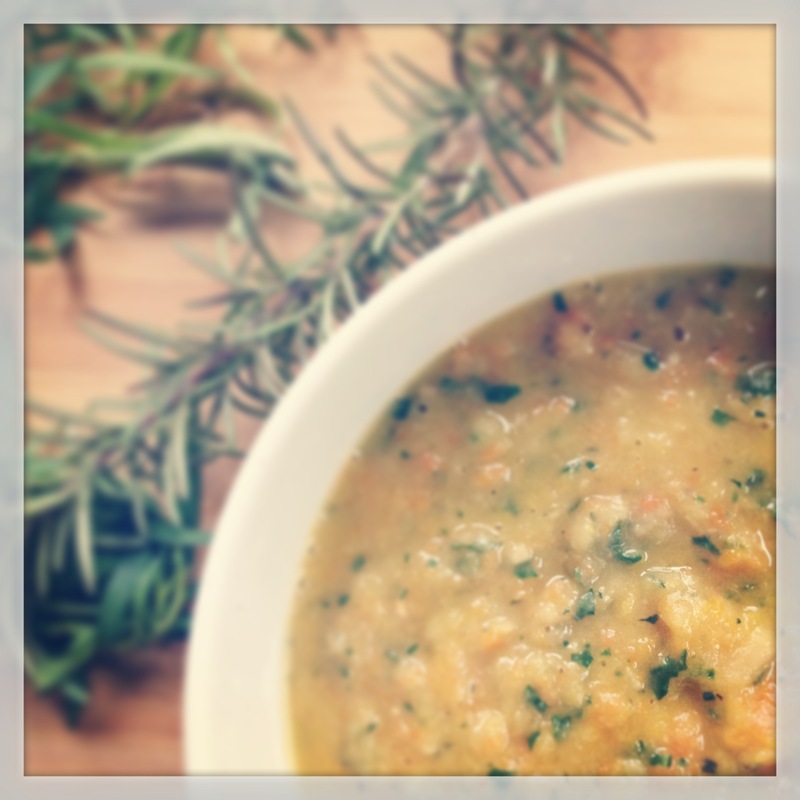 If you want to let the flavors meld a bit more, you can leave the soup on low heat for a while longer. 5. Taste the broth for salt and add as much as you like. 6. Depending on your texture preferences, you can go a number of routes here: leave it completely “rustic” and stew-like (would be great over rice), OR blend it partially with an immersion blender so there is some smoothness and some larger chunks (that’s what I did) OR blend it completely for a silky, luxurious pureed soup. 7. Finish by layering on your desired toppings. Enjoy! On a damp, foggy late fall day there are few things more soul-warming than nestling up to a steaming bowl of homemade soup. The ritual of chopping, sautéing, stirring, and ladling engages your hands and mind. The comforting goodness that results lifts your spirits as you revel in the small accomplishment of feeding yourself and your loved ones from a communal pot. Out of nowhere, you realize the birds outside your window are singing despite the darkness and drear. Unfortunate events in our lives can manifest themselves as emotional fog, casting gloom over what might have otherwise been a day of gracious, open-eyed life-living. When something happens to us, when another person wrongs us or hurts us or lets us down, the negative energy can permeate our very fibers. It takes courage and will to rise above the fog, to let the sun burn the clouds away and see the world as it really is: miraculous. And we can’t always do that on our own. I am one of many students at my university that has recently been wronged: we’ve had money and personal belongings stolen from us, unexpectedly and in the midst of impending exams and holidays – a time when we could all use a big hug rather than a metaphorical punch in the gut. These acts hurt and enrage us and make us feel helpless. This experience made me less apt to trust others and weakened my faith in the unspoken bonds I share with all the hard-working, diverse women that surround me in our beautiful little school. But then there are the people that burn away the fog, that fortify our belief in humanity, that help shift our outlook back to optimism and love. Thank you to you. You are my sun today. I am writing this because you changed my thought patterns, something I could not have done alone. This soup is for you, too. 1. In a 4-quart or larger pot, melt 2 tablespoons butter over medium heat. Add leeks and sauté until just softened, but not brown. Add garlic and cardamom and sauté a minute more. 2. To the pot o’ alliums (leeks and garlic), add carrot coins and potato chunks. Pour in your stock and turn heat to medium-high, bringing liquid to a boil then reducing to a simmer. Add white beans, rosemary sprig and Parmesan rind, if using. 3. Continue simmering soup until carrots and potatoes tender, adding more liquid as needed for desired consistency. 4. Turn heat to low. Stir torn kale leaves into soup and cover, cooking just until kale is bright green, about 3 minutes. 5. Remove soup from heat; allow it to cool slightly. 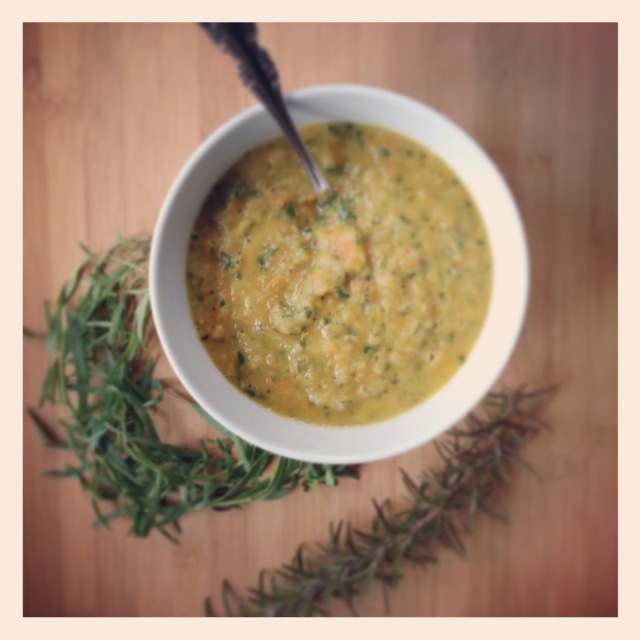 Puree soup with standard or immersion blender until your preferred texture is reached. I liked it mostly smooth, allowing just a few hearty chunks of potato and flecks of kale to prevail. 6. 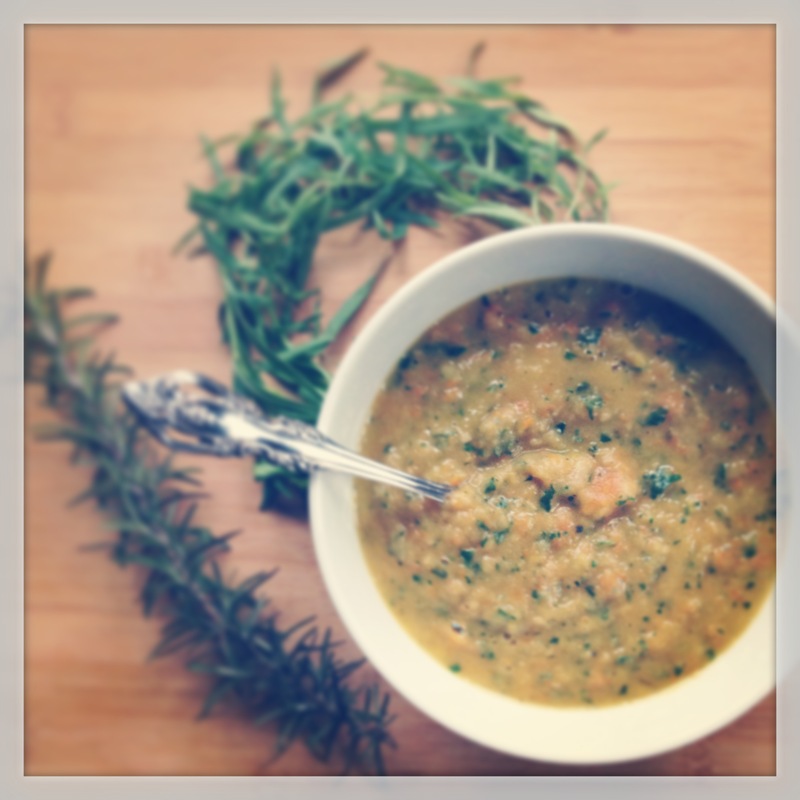 Serve with a drizzle of olive oil plus salt and pepper to the soup-eater’s liking. 7. Let the steam from your bowl rise up and give you a mini-facial; listen for birds.